After a leisurely start exploring the local hawker centre near the apartments we were staying, we decided to spend our first full day in Singapore visiting the famous Singapore Botanic Gardens. 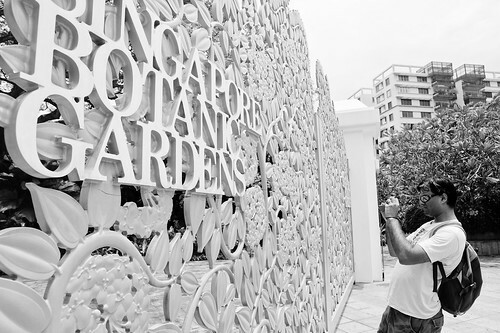 The Botanic Gardens is a massive 74 hectare garden full of beautiful flowers and colours. Unknowingly, we picked the same day that Prince William and Princess Kate were visiting the gardens, but we didn’t spot them or their entourage (it’s a huge garden). There are many gorgeous areas within the Botanic Gardens, including a large lake called Swan Lake, Ginger Garden, National Orchid Garden (there’s a small $5/person fee for this area), Evolution Garden and more. We also spotted lots of great sculptures. Here’s a brief photographic journey of our day wandering around the gardens.